India's latest batting sensation Shikhar Dhawan was ruled out of the fourth and final Test against Australia due to a fracture on his left hand. Dhawan will be out of action for six weeks after sustaining the injury while fielding during the third match at Mohali. The BCCI said in a statement that Gautam Gambhir, who was omitted from the initial squad for the four-match series due to a prolonged form slump, was included in the team but he too also was unavailable due to jaundice. The selection committee then picked Suresh Raina to join the team. "Shikhar Dhawan was ruled out of the fourth Test against Australia, scheduled to be played at Delhi from 22 March 2013 to 26 March 2013, after sustaining a fracture in his left hand. He will be out of action for six weeks," the BCCI said in a statement. Dhawan, who had smashed his way into the record books on Saturday by scoring the fastest-ever Test century on debut in India's first innings in the third Test against Australia, would consider himself to be unlucky as he would miss a Test match in front of his home crowd. 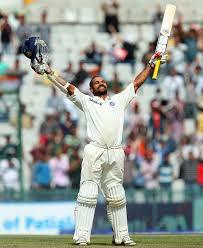 Dhawan, who made 187 at Mohali, suffered a hand injury while fielding on the fourth day.